When my sister was here I was telling her that I had lots of material but I had a 'creative block' - and I wasn't sure what to do with it all - or what to make next. She suggested I should be ruthless with my fabric and get rid of anything I knew I was never going to use. I haven't done that yet (I'm still in 'must not waste a scrap' mode) but today I did visit my favorite fabric store in the city to get some inspiration and once there it was hard not to be naughty. While I was there I spotted this very happy looking lady. All you need is - 1 piece of fabric (40 1/2" x 35 3/4") and cotton for sewing. 1) Along one of the 40 1/2" edges press a 1/2" fold. Then fold over another 4" press and pin. - and the right side looks like this. But I think you could do almost anything here - add a decorative stitch, ric rac, ribbon ..... endless possibilities! 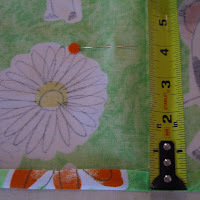 3) Fold your material in half (wrong side out - your material should now measure 31 1/4" x 20 1/4") and sew shut. 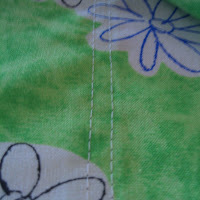 Reinforce the seam with an overlock stitch. 4) Turn right side out and press. And that is it - in less than 30 mins a pillowcase! A personalized pillowcase filled with love (if a bit lime green). But who will test it's performance? This little man thinks it is comfy enough so off to the post office it goes. I just can't wait to make more now ... so easy ... so simple and I think (if made in a pair and in a different fabric of course) they would make a fabulous housewarming gift. I'm also thinking an applique tooth fairy themed pillowcase would be super cute for little ones too ... my sister has obviously given me far too many ideas ... the creative block might be officially over for now. Rachael, the pillow case looks fantastic. You've given me some ideas here. Your post also made me a bit nostalgic - we were in NYC about 3 years ago and We stayed in Bleecker St. I found the City Quilter and spent a lot of time (and a bit of $$). It's a lovely shop. What a lovely pillowcase! I think the cows are fabulous, and yes they would make great gifts. I mean where are you going to find a pillow case like that in a department store. 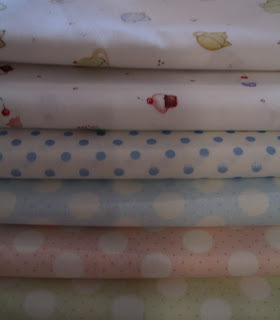 Now you will have me going through my fabric stash for some cute fabric to make some of these. 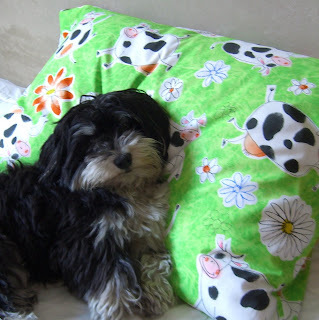 I am crazy about your wonderful cow pillow case! Your sister is so lucky to be the recipient! This is a great way to use us fabrics. Thanks! What a great idea. it looks lovely. I'm sure your sister will love it. I'm going to go and have a look through my fabric stash rightaway!! PS thanks for telling me about my dodgy etsy link, that will teach me to try and write a post with two hysterical eight year old girls in the room! If I ever need to make a pillowcase I will follow your tutorial. Thanks for the guidance. 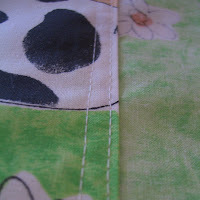 The cow fabric is super jolly! I am a very lucky sister! I love it! Cows! 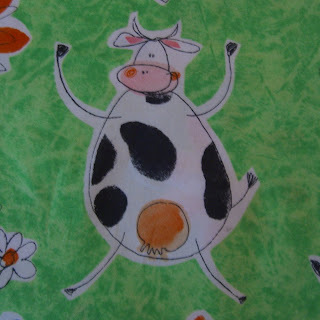 Cute cow fabric and great pillowcase! Thanks for sharing! i just made a pillowcase yesterday for a little boy's birthday party. we wraped his present in it. that way there is no wasting money on wraping that gets thrown away and the birthday boy gets another gift. i used very cute flannel with camping pictures all over it. your doggie looks so cozy. very cute pillow. I think a tooth fairy pillow case sounds like something which DEFINITELY needs to be made, what a great idea. The fabric is a hoot, who could feel down with green like that and your dog looks so comfy all cozied up. Thanks for sharing the tutorial. Pillow cases are such a fun, easy project and kids with comfort pillows instead of comfort blankies (like myself) love them. I think the applique would add a nice touch too.On another fun note, I tagged you over at my blog place today, play along if you'd like. Great pillowcase - your little helper certainly looks like he'd appreciate one too! By the way, I've just tagged you - no obligation just take it up if you fancy it! love your new fabrics and thanks for posting the pillowcase tutorial, im going to give it a go.